We offer a beautiful selection of baby gifts and soft baby toys, perfect for any new born baby or toddler, all available to buy online. 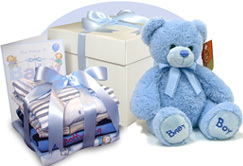 Once you find the perfect baby gift you can choose to have it gift wrapped. We will make sure every little thing is just right, from the personalised new baby card to the beautiful gift box and the hand-tied bow. Our baby gift baskets inlcude a selection of baby essentials, along with a soft baby toy and a new baby card; which you can include your own personalised message. 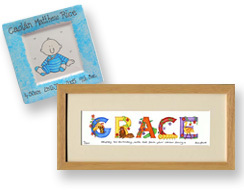 If you are looking to send a unique baby gift, then our selection of personalised baby gifts are the perfect choice. We have a select range of personalised hand painted baby plates suitable for a new baby, a baby's christening and a happy birthday gift. In addition, we have also included a new baby gift basket which includes a personalised plate too. Or why not chosse one of our personalised framed pictures. With so many baby gifts to choose from on Babycity, it can be daunting to know what to buy as a gift. So to ensure you give the perfect baby gift, send a babycity gift voucher and let that special someone receive the gift they really want.